Are you planning to visit the Great Wall in China? There are many aspects to The Great Wall. With the proper information, you can have a memorable trip. In this article, we have put down some key points that you should know. 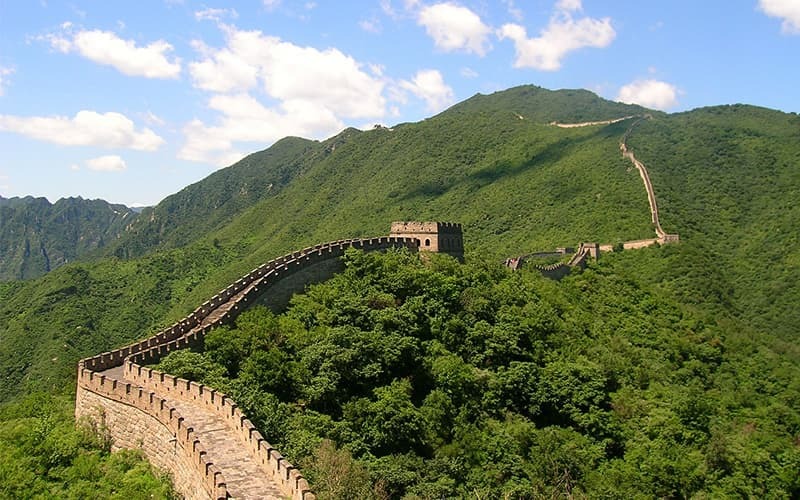 The Great Wall of China covers nine provinces and is more than 21000 kilometres long. It is humanly not possible to see the entire wall, not as a tourist at least. So in all probability, you should be seeing only a section of it. Choose the section that you want to see carefully. Read about it and select one that suits your interest and your fitness level. The best seasons to visit the Great Wall are spring or fall. This is a great time to enjoy the beautiful scenery. The Great Wall remains less crowded during this time, which will help you to enjoy it without disturbances. Take the help of a guide to understand the history and the features of the Wall. Let's start now! We recommend visiting the Wall during spring or autumn. The weather's mild and the crowd is lesser. The mountains of Beijing remains cool during the spring months of April and May. Flowers are in full bloom at that time. Fall, on the other hand, is a great time to go hiking. The clear weather can help you see the entire expanse of The Great Wall. The mountains get different colours at that time and present amazing scenery with the contrasting grey colour of the Wall. However, if you are planning to visit the Wall during summer or winter, you need to know a few things. The peak tourism season is summer and the Wall remains pretty crowded. The weather is hot with occasional downpours. Winter is very cold and sometimes snowy. Naturally, there will be almost no crowd in the Wall at that time. Picture: Great Wall in spring. Warm and lush. There are various ways to travel to The Great Wall. While tour buses are available, they may not take you everywhere you want to go. Moreover, you will be travelling with other tourists, so the experience may not be that pleasant. Private tours will be more convenient and we recommend the same. You will have your own vehicle which will take you where-ever you want to go. If you want to rest a little bit or take a detour, the guide will definitely oblige. Inquiry for a Great Wall now! While it might seem that it is impossible for people requiring special needs to visit The Great Wall, the reality speaks otherwise. Several sections of The Great Wall like Badaling, Mutianyu and Juyongguan are wheelchair-friendly. Ramps fitted at the Badaling section make it easy for wheelchair users to reach the north watchtower. The Mutianyu section has cable cars and ramps suitable for wheelchair users to reach the 14th watchtower. One can catch a nice view of the Wall from all these places. The Juyongguan section is located at the valley bottom and can be easily reached by the wheelchair. The Great Wall also has flatter areas at the Shanhaiguan area in the east coast the Jiayuguan region in the western desert. While it takes around 2 hours to reach the Great Wall from Beijing, reaching the Great Wall the previous night and staying a hotel nearby can help you spend more time at The Great Wall. It will also give you the chance to visit The Great Wall during the early morning when there is almost no crowd at the Wall. There are several hotels located nearby. By staying the night, you can avoid traffic jams or queues at the ticket counter and of course the tiredness of a near about 2-hours journey. You can see the Great Wall with a lot of time in hand, catch the beautiful sunset and even the night-time view of the Wall. You can also camp at The Great Wall. However, camping is only allowed in the wilder sections like Gubeikou or Jiankou. Be prepared to enjoy a real camping experience with exposure to the rural culture. These sections, however, do not have much shops or amenities, so ensure to carry all the camping equipment with you when you reach the Great Wall. Food options vary from section to section at The Great Wall. 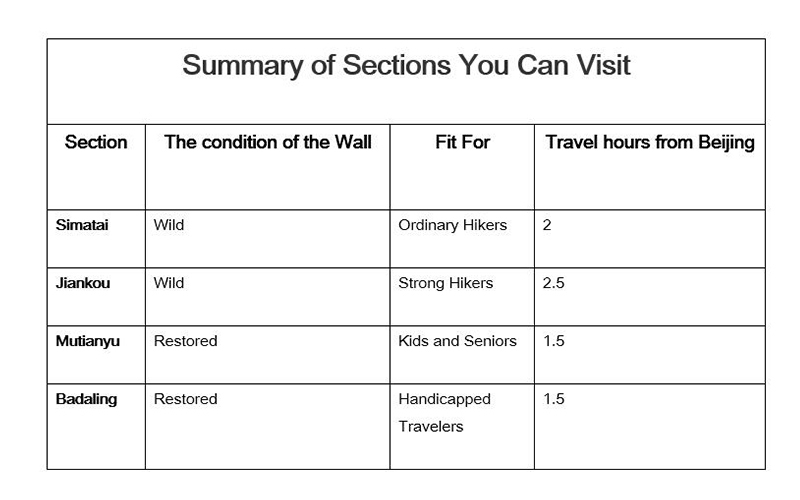 The restored sections have a lot of options for food and stay. You can enjoy the rustic local cuisine at the eateries here. The wild sections don't have many restaurants or hotels, so make sure to carry your own food if you are planning to visit these parts. The Great Wall is a storehouse of history and information. Hiring a guide is always recommended not just to stay informed, but also to navigate through the Wall. Some of the restored sections like Mutianyu or Badaling are well-restored and easier to visit. However, the wilder sections like are mostly located in the mountains and is easier to navigate with the help of a guide. People have actually gotten lost without a guide int he wild sections.